The USA is vulnerable to electromagnetic issues, either from natural causes or man-made ones. Iran and North Korea, both of whom US President Trump has riled up to a degree,allegedly have capability that way. But even more limited use by terrorists could wreak havoc. Yet, what could happen if the USA itself were to be hit by one or more EMP weapons in the right areas? · Emergency services would severely be hampered. There are various economic catastrophes including war, famine, and pestilences (Matthew 24:4-8) and troubles (Mark 13:8; Jeremiah 30:7), like debt, that will cause a massive catastrophe in the future. And a man-made downing of the electrical power grid through hacking and/or an EMP event could be one of the coming troubles as I have warned readers for many years. Could problems with the electrical power grid caused by one or more electro-magnetic pulse bombs, solar flares, and/or other phenomena help weaken the USA to the point of allowing it to be taken over? Does such potential exist? If so, is this consistent with any biblical prophecies? What are some of the severe consequences that the USA would face in the event of an electrical power grid failure? Is there evidence in scripture that the USA will be taken over in the 21st century? It would not surprise me if electrical disturbances were part of the actions by terrorists related to prophecies in Psalm 83 and elsewhere. While most in the USA act like it will go on indefinitely and cannot truly be brought down, the reality is that electrical, weather, pestilence, and other events can devastate the USA. I believe a combination of ‘black swan’ events including terrorism, weather issues, debt problems, and crop failures, which are consistent with Jesus’ words in Matthew 24:4-8, etc. will hit the USA and make it vulnerable to its prophesied takeover (cf. Daniel 11:39). Consider that in the end times, the Bible tells of a King of the North (Daniel 11:29-45), King of the South (Daniel 11:40-43), and the Kings of the East (Revelation 16:12-16), but no King of the West? This will cause the world to marvel (Revelation 13:3-4). It is likely that the USA will have to be in a weakened state to be taken over. And while deceit will be a factor (Daniel 8:25; Lamentations 1:1-2), the fact is that the USA will be hit with troubles and sorrows, beforehand (Matthew 24:4-8) that will weaken it. The USA is highly dependent upon electricity and its power grid is at risk. And according to various reports, an EMP attack could happen tomorrow. In other words, do not think it will take years for enemy nations to develop this ability–many already have it. And some nations may be more than willing to share that ability with terrorists. Electrical End of the USA? Could problems with the electrical power grid caused by one or more electo-magnetic pulse bombs, solar flares, and/or other phenomena help weaken the USA to the point of allowing it to be taken over? Does such potential exist? If so, is this consistent with any biblical prophecies? 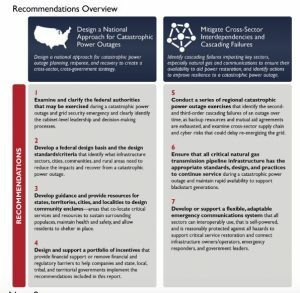 What are some of the severe consequences that the USA would face in the event of a electrical power grid failure? Is there evidence in scripture that the USA will be taken over in the 21st century? Dr. Thiel addresses these issues and more in this video. This entry was posted on Monday, January 14th, 2019 at 4:00 pm	and is filed under Prophecy.